Their Royal Highnesses the Duke of Cambridge and Prince Henry of Wales have launched a search to find exceptional young people from Belize and across the Commonwealth who will receive an award from Her Majesty The Queen. As part of The Queen’s Young Leaders Programme, young people between the age of 18 and 29 from all backgrounds and all Commonwealth countries are to be rewarded for their achievements in transforming their own lives and those around them and supported to go further. This unique, new initiative recognises that young people have the ability to make a huge impact on their communities. The Programme aims to create new and exciting opportunities for young people, enabling them to reach their full potential, step up as leaders and go on to improve the lives of many others in the Commonwealth. On behalf of The Queen, The Duke of Cambridge and Prince Harry launched the search at a reception which included the first ever social media hub to be installed at Buckingham Palace. They took part in a Google Hangout connecting them live to inspirational young people who are already doing great work in four Commonwealth countries and tweeted a picture of themselves to help spread the message that #TheSearchIsOn. At the event, The Duke of Cambridge said: “The Queen’s Young Leaders Programme is intended to find young leaders who have determination, and to equip them with the tools to succeed. 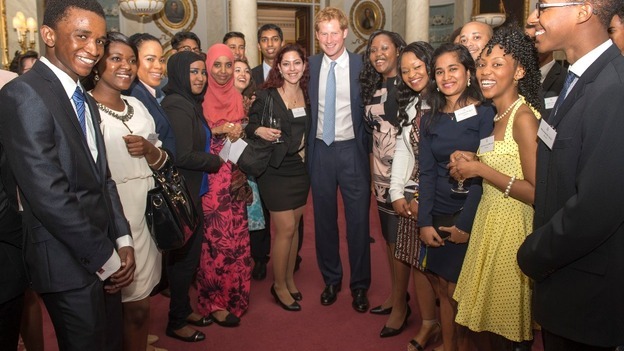 Prince Harry added: “The young leaders of today have the greatest opportunity of any in our historyto reach out across the Commonwealth and affect change on a global scale. Lockie Cooke from Australia took part in the Google hangout with the two Princes. After noticing the lack of understanding between Australians and indigenous cultures, Lockie set up the Indigenous Communities Education and Awareness Foundation, a not-for-profit organization that aims to encourage young Australians to take an active role in promoting reconciliation by increasing awareness of, and respect for, indigenous cultures. The life changing Programme has been established by The Queen Elizabeth Diamond Jubilee Trust and is run in partnership with Comic Relief and the Royal Commonwealth Society to honour The Queen’s 60-year contribution to the Commonwealth. Over the next five years, at a time when the Commonwealth is home to the largest generation of young people ever in its history – over 1.3 billion of a total 2.2 billion citizens - The Queen’s Young Leaders Programme will support thousands of young people to make their visions of a better society a reality. Young people from Belizecan apply or be nominated to win an award and become a Queen’s Young Leader from Wednesday 9 July - 10th October 2014. Visit www.queensyoungleaders.com for more information. #TheSearchIsOn. The Queen Elizabeth Diamond Jubilee Trust, in partnership with Comic Relief and The Royal Commonwealth Society, has established The Queen’s Young Leaders Programme in honour of Her Majesty The Queen’s 60 years of service to the Commonwealth. • An Awards scheme celebrates the achievements of exceptional young people who have proved themselves to be inspiring leaders in their communities and may have overcome challenges in their lives to do so. • A Grants scheme supports organisations in selected countries across the Commonwealth that work with young people to help solve the problems affecting their lives and the communities in which they live with innovative, youth-focused solutions. Each year from 2014 to 2018, 60 inspirational young people will be selected to receive a Queen’s Young Leaders Award and become ‘Queen’s Young Leaders’ – one for every year that The Queen had served as Head of the Commonwealth at the time of her Diamond Jubilee. At least one young person from every Commonwealth country will receive a Queen’s Young Leaders Award over the lifetime of the Programme. Holiday Bash a spooky splash!